Open the song that you want to share. Choose Share→Send Song to iTunes. To create a ringtone and send it to iTunes, choose Share→Send Ringtone to iTunes. Click in each of the four text boxes to type the playlist, artist name, composer name, and album name, respectively, for the tracks you create. You can leave the defaults as they are, if you prefer. Each track that you export is named after the song’s name in GarageBand. 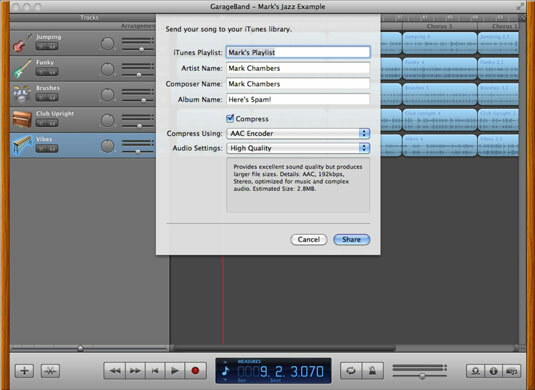 Click the Compress Using pop-up menu and choose the encoder GarageBand should use to compress your song file. The default is AAC, but you can also choose MP3 encoding for wider device compatibility. Click the Audio Settings pop-up menu and select the proper audio quality for the finished file. The higher the quality, the larger the file. GarageBand displays the approximate file size and finished file information in the description box. After a second or two of hard work, your MacBook opens the iTunes window and highlights the new (or existing) playlist that contains your new song.